You can use apps after install it. But sometimes you need to remove unwanted apps from your android device. First, you need to find apps which you are want to uninstall. After that, you can delete apps on the android device. Learn an easy way to permanently delete unwanted apps from your android mobile phone. 1. Unlock your mobile phone. Press Apps button to open your mobile apps page, scroll left or right, find out Settings button and touch up to your android phone. 2. Scroll left or right, find out Settings button and touch up to your android phone Settings button. 3. 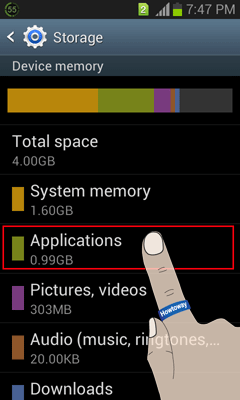 Touch up to Storage button from your android phone settings page. 4. 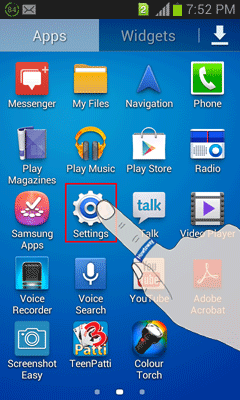 Touch Applications button to see your android phone all installed apps. 5. Scroll down to find out which apps you are want to uninstall and touch up to this app. 6. You will see Uninstall button with your selected app image. 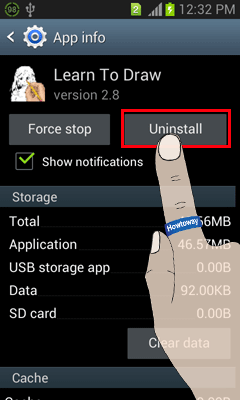 Touch up to Uninstall button to uninstall this app from your android phone. 7. You will see a message then touch OK button to uninstall this app. 8. Wait hare few seconds after that you will see “Uninstall finished” message. Touch the Ok button to close this window. After that, you will not see your recently uninstalled apps on your mobile phone. Using the same way you can remove unwanted apps from your android device.